Real Living's website recently published this article on my favorite things at home (click the link to see my list!). The article came out in 2013. Two years later, the items on that list I gave to Real Living are still my favorite things! Well, except for the favorite appliance. I love my microwave oven now. I refused to buy one for years and years, preferring to heat food on the stove or in the oven. But now that I have three kids, I just can't do it anymore! All the preparation then the pots to wash up after! So because I value my time more than anything now, my microwave oven is my favorite appliance now! A super favorite thing that endures all these years is the photo wall. I love it. Vince loves it. The kids love it. Everyone who visits our house love it. There are more photos on that wall now. More happiness in my life! What a joy to have a reminder of how blessed I am just because I see this wonderful wall every day! Every family should have a gallery of beautifully framed photos! You can buy inexpensive but nice picture frames from National Bookstore, Our Home and SM Department Store. That's where we buy ours.What we also do is buy framed prints at furniture shops, take out the generic print and put our photos in. That's the secret to our really nice frames. Or we ask for picture frames for Christmas so that people will get us expensive ones haha. Where else can we buy gorgeous photo frames? 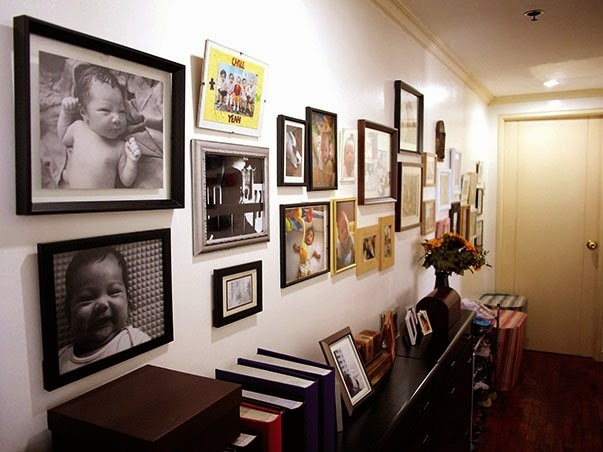 This is my dream, having a photo gallery wall in our house. Well our house is not yet fully done so I can't start hanging pictures. But I already have a lot of pictures to frame. I also got a lot of pegs from Pinterest! Beautiful! When I have my own house, I also want to put a photo wall. It chronicles the family's journey so prettily pa.